This meter is available in a transducer configuration (EPM 7000T) that comes without a display and has a DIN rail mount. It’s ideal for use in retrofit applications and where budgets are a large consideration. KYZ pulse outputs that are mapped to absolute energy. The EPM 7000 meter provides revenue class (0.2%) three phase power metering with optional Ethernet, relay, status, and analog output communication modules. This flexible meter can be used for a wide range of high accuracy applications including disturbance recording and power quality studies. EPM 7000 can easily be mounted in a panel for generator monitoring, substation automation, power quality studies, data recording and more. The meter can also provide data to RTUs, PLCs and other control devices. 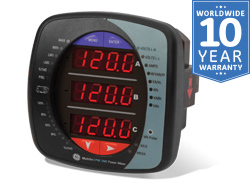 The EPM 7000 is a highly accurate meter providing 0.1% accuracy for Voltage and Current. The unit’s real-time clock provides time stamping of all logs as they are created. Up to 2 MB of data can be logged for analysis of historical trends, limit alarms, I/O changes and sequence of events. 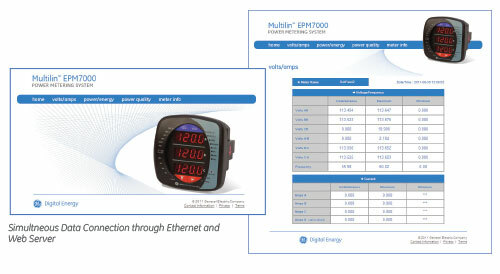 The EPM7000 can record voltage sag, swell, and current fault events. It records up to 512 samples per cycle, when events occur the meter will record pre and post event activity at a programmable sampling rate. Up to 4MB of storage is available allowing for a maximum of 170 events to be stored. Waveform data is stored in a circular buffer, this means that the meter is always recording. The data sampled can be viewed as a real-time waveform, giving the user the ability to use the meter in an oscilloscope fashion. Harmonics can also be viewed in realtime up to the 40th order, and stored waveforms may be viewed up to the 255th order. This meter allows voltage input measurements 20 Volts to 576 Volts Line to Neutral and up to 721 Volts Line to Line. This ensures proper meter safety when wiring directly to high voltage systems. The unit will perform to specification on 69 Volt, 120 Volt, 230 Volt, 277 Volt and 347 Volt power systems. EPM 7000 meter uses two current input wiring methods. Method One - CT pass through. 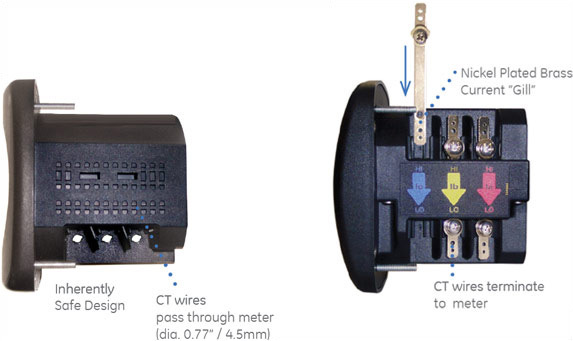 Directly pass the CT through the meter without any physical termination on the meter. This insures that the meter cannot be a point of failure on the CT circuit. This is preferable to utility users when sharing relay class CTs. No Burden is added to the secondary CT circuit. Method Two - Current “Gills.” The meter additionally provides ultra-rugged termination pass through bars allowing the CT leads to be terminated on the meter. This also eliminates any possible point of failure at the meter. This method is also a preferred technique for ensuring relay class CT integrity does not get compromised. No terminal blocks are required and this stud based design ensures that CTs will not open under a fault condition. 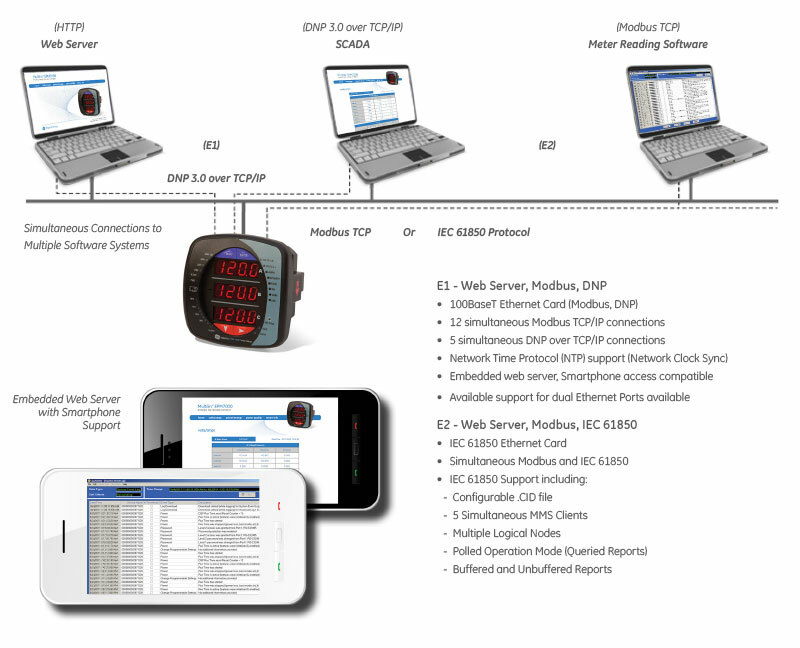 Through an optional high speed Modbus communications interface, the meter can also provide data to RTUs, PLCs and other control devices at Baud rates ranging from 9600 baud to 57.6 kbaud. The EPM 7000 has a rugged design for harsh environment. This is especially important in power generation, utility substation, and critical user applications. The structural and electrical design of this meter was developed based on the recommendations and approvals of many of our utility customers. 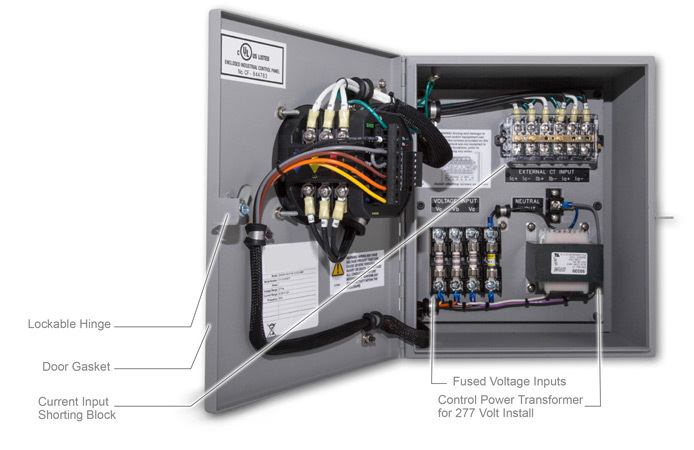 EPM 7000 can easily be mounted in a panel for generator monitoring, substation automation and more. The unique dual design combines ANSI and DIN mounting structure and allows easy installation for both new metering applications and retrofit of existing analog meters. The unit mounts directly in an ANSI C39.1 (4” Round form) or an IEC 92 mm DIN square form. The EPM 7000 is equipped with a virtual firmware based switch that allows feature upgrades through communications even after installation. This allows you to optimize your metering investment. Begin with a standard meter and upgrade it with more functionality as new features are needed, such as data logging, waveform capture or more memory. The tables below describe the feature sets of each of the software and waveform options. All EPM 7000 meters come equipped with Front Mounted IrDA Communications port. This eliminates the need for a communications cable when the technician has an IrDA-equipped PC or a PDA with COPILOT EXT software. The meter can be set-up and programmed through the IrDA connection. 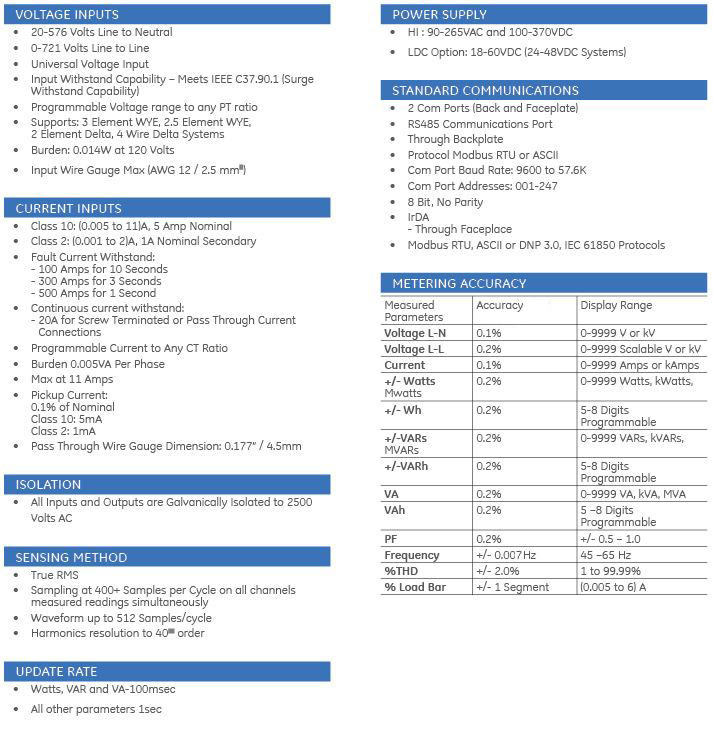 The RS485 serial interface supports Modbus, and DNP 3.0 at baud rates ranging from 9600 to 57.6K. Also supported are KYZ pulse outputs that are mapped to absolute energy. EPM 7000 meters have two expansion slots used to accept new I/O cards. These slots can be equipped at the factory or in the field. The meter auto-detects installed I/O cards. Up to two cards of any type may be used per meter. Daisy Chain switchable built-in logic mimics RS485 half duplex bus. The EPM is available in a transducer configuration. This meter version comes without a display and has a DIN rail mount. It’s ideal for use in switchgear retrofit applications where access to the meter face and display is not necessary, and where budgets are a large consideration. Expanding existing switchgear or installing new metering capability can be challenging due to space limitations, downtime and installation and equipment costs. GE's Multilin Meter Enclosure is a pre-wired configured, economical solution for both retrofit expansions and small scale meter installations that allows the expansion of existing switchgear capability without expensive and time-consuming design. 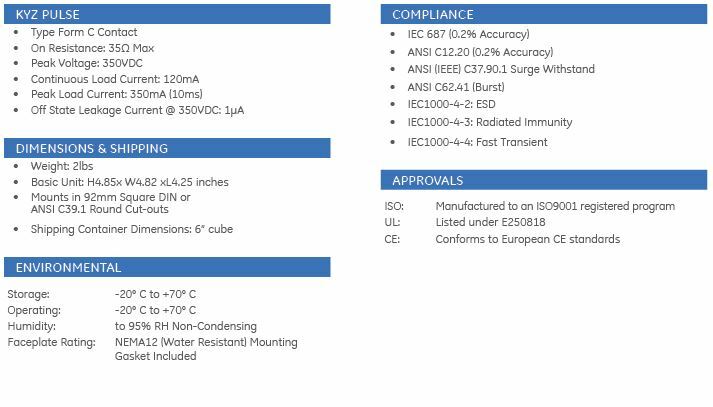 When ordered as a meter option the enclosure provides a factory pre-wired, installation-ready metering solution that further drives energy cost savings, by enabling the measurement of key energy usage information along multiple metering points for new or existing systems. Ordering the enclosure is simple when selected as an option during meter configuration, ensuring correct pre-wired meter-compatible delivery.